The number of a company’s clients increases when it grows, and more clients mean that the number of shipments will also increase whether locally or internationally. Shipping cargo is not simple especially for a company that doesn’t possess a shipping line, which is true for the majority of businesses, but an excellent way to solve this problem is by outsourcing the shipment through a freight forwarder. Teaming up with a freight forwarder allows the company to focus on the tasks associated with its growth instead of worrying about the delivery of the goods. Even companies with an existing supply chain would benefit from freight forwarders when the company has a new client from far away. Freight forwarders have a lot of experience in the field of product-shipping, and they have gathered a lot of knowledge on how to ensure that your products reach your market in top-condition. Before being able to import and export products, you’ll have to fulfill the many different required documents. Freight forwarders will assist you in fulfilling those various documentations ensuring that you’ll have a hassle-free experience and that you’ll be able to focus on other tasks at hand. The documents freight forwarders will assist in accomplishing include commercial, transport, financial, and government documents, as well as clearances and permits. Failure to comply would classify your company’s shipments as smuggled goods which would damage your reputation in the industry. Smuggling is against the law, and it is problematic when your items become illegal because of the lack of documents. Besides losing credibility, it is expensive to get through a smuggling case. Thanks to the accumulated experience of freight forwarders, they’ve made many connections with other transportation companies all across the globe, and they can negotiate with their affiliated companies on your behalf to reduce transportation costs. Without freight forwarders, a company would have a hard time bargaining for lower prices especially when it is that company’s first time, but since freight forwarding companies regularly arrange deliveries, they have better knowledge on saving money during cargo delivery. They can also consolidate small product shipments from several clients into one large shipment to make the shipping fee more manageable for small and starting businesses. Outsourcing shipments to freight forwarders not only allows the company to save money but also to ensure that their products will arrive safely and will avoid delays. Freight forwarders help in achieving these through cargo insurance document management services, route optimization, and transport tracking. Since it is the primary goal of product-driven businesses such as freight forwarding that its cargo arrives at the right location intact and on-time, they can ensure that their clients’ products will reach their destinations. Insurances would protect goods so that they are converted to cash when damaged and stolen in case accidents and robberies take place. Lack of insurance would mean that companies won’t receive compensation for their lost and damaged items. Since cargo in transit is in constant danger, it makes sense to invest in insurances which freight forwarders will arrange for you. Route optimization makes deliveries easier and less time-consuming by choosing the faster and most convenient routes available. Most forwarding companies use modern technology to find the best course deliveries can use to ensure that they arrive on time. Time-sensitive products like perishable foodstuffs would benefit from route optimization. Transport tracking uses tracking numbers to determine the current location of a shipment ensuring that it does not get lost. Monitoring the status of your cargo can be done through transport tracking. Untracked goods may not end up in the right destination, so transport tracking also serves as another means of protection for your shipments. Freight forwarders ensure that their clients receive excellent service for a lower price than what their clients’ would have expended if they managed the delivery themselves. They negotiate prices with shipping companies, identify the best routes a shipment can use to get to its destination, protect the cargo through insurances that converts lost and damaged goods to cash claims for the client, and track the products for added protection. Unoptimized supply lines are expensive and prone to dangers. They create a hassle for the company that needs to ship items since delivery teams would likely end up in traffic jams and inconvenient routes especially when it is their first time sending goods to a new client. The trouble of filing insurances to protect the cargo would impede on a growing company’s growth since its personnel would have to split their time in managing the company itself and in managing the process of filing insurances. Freight forwarders assist in optimizing a supply chain and hiring them would be beneficial to the company. Every partnership requires trust, however, and partnering with a freight forwarder that isn’t dependable, trustworthy, or experienced might prove problematic for your company. A freight forwarder with a long history of service and a broad network of connections is an excellent example of a dependable company that can meet your needs. A freight forwarding company wouldn't last long if it weren’t trustworthy. A trusted freight forwarding company generally has trained, competent, and experienced employees that provide excellent services for their clients. The matter of choosing which company to initially trust and hire lies on the credibility, history, experience, and services of the forwarder and once a healthy relationship is established, both the forwarder and the client can continue transacting their businesses. 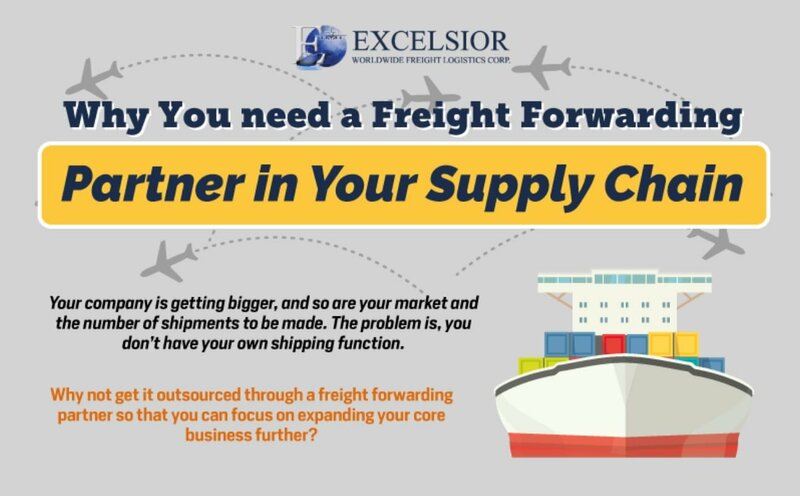 Excelsior's infographic shows simple reasons why it is essential to team up with a freight forwarder.